It was an exercise laced with emotions yesterday as fiery catholic priest; Rev Fr Ejike Mbaka was escorted by thousands of catholic faithful in Enugu to his new parish at Emene, an outskirt of Enugu urban. The faithful gathered at the Christ the King,CKP, GRA, Enugu as early as 7.00 am, preparatory for the movement. Several lorry loads, buses and cars, all line the street in what could be dubbed a triumphal exit that halted economic and other activities along major streets where the long convoy passed. 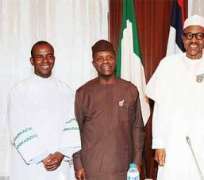 Mbaka, had while addressing the crowd before the movement, expressed reservations over the transfer, which he said was calculated to make him suffer by certain leader of the church. He said:“I know we are going to suffer within now and few months to come. I am going to suffer and suffer; I know that. I'm going to suffer because I have no place to put my head. I am going to suffer because I have no place to keep the Adoration ministry's assets. I know I'm going to suffer. will turn your sorrow to joy. “The quantum of the assets of the Adoration Ministry is the only thing I am bothered at for now. Where am I going to keep them? I am going to stay in one small room that has only one small bed, one small table, little toilet and bathroom. whoever that has offended me, I have forgiven. I won't fight anybody or even dream of battling anybody. If anybody allows the devil to use him, the same that advised you to make a mistake will laugh at you when you cry over the error. The baby is born, there is no going back. We are moving out. We have been doing it and we will do it again. Decrying what he described as “attempt by some persons to politicize the church”, by feeding the Bishop falsely, he noted: “ I am giving God the glory and I welcome the church's choice and action with absolute acceptance and obedience. So there is no negation to what God has approved and what the church suggested. Nobody should see me as a recalcitrant priest. I am not. I have taken an oath of obedience and I stand on it. I pray God to bless all of you who in one way or the other have supported the work of God here and those who have sincerely allowed God to use him or her for the jobs we did here all these years. God will bless the people of God here and reward you according to your labours. The parish is not going to collapse, it the church that will continue to grow”. Njinike, Enugu where he has been posted as Resident Priest serving fewer than two Priests should be seen as the “journey of the Israelites out of Egypt”. I am praying that God will keep his church and my fellow adorers so that our journey to Umuchigbo will be a journey of Israelites out of Egypt. Some of them were grumbling leaving Egyptian soil because they were having the phobia for the unknown, but I am telling you people as a courageous leader, do not be afraid. We are moving and in not distant time, you people are going to smile', he told them.